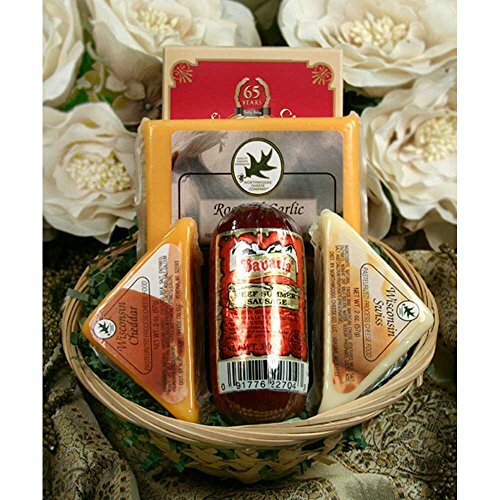 The Hostess Mini Cheese Gift Basket is a tasty way to say hello or thank you any time of the year. Northwoods Cheese Company has filled the wicker basket with a 2 oz. cheddar and a 2 oz. Swiss triangle of pasteurized process cheese food, a 3 oz. beef summer sausage, a 6 oz. square of roasted garlicl flavor pasteurized process cheese food and a 1 oz. box of Venus Wine Crackers. The pasteurized process cheese has a shelf-life of 12 months and requires no refrigeration until it is opened.. On rare occasions, or during warm weather, a product of equal or greater value may be substituted if a listed product becomes unavailable or is unsuitable for shipping. Includes summer sausage and crackers, too! On rare occasions substitutions of equal or greater value may be made for listed items.